We have reached the first level of success in this quest to help Alberta Easter Seals help kids and adults with disabilities. Bob is scheduled to step off at 10:45AM on Sept 10th. If you are in the area, come out and cheer him on as he conquers his nervousness about heights and helps the Easter Seals Kids. PS: If you are wondering how this relates to Secret Selling Tips... one of the secrets is having an attitude and action plan for giving and being involved in your community. That attitude, for some unexplained reason, opens doors and attracts those who would support you and deal with you based on your commitment. In sales, your success depends on your ability to get the order and serve your customer. But you have to ask for the order. Anyone who raises a minimum pledge of $1500 for the Alberta Easter Seals Drops Zone before Sept. 10th (actually before my training on Sept. 5th) will earn the chance to rappel down the side of the 26-story Sutton Place Hotel (10235 101 St in Edmonton). 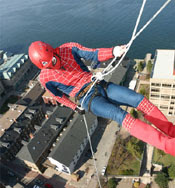 Since 2005, more than 600 superheros joined this exclusive Superhero Club for Easter Seals. I am asking for your involvement in making that goal a reality. I could donate the $1500 for the chance to walk down the building, but that would defeat the process of engaging and involving a greater number of people in the process. People like you... I believe in the power of making a 'leveraged' difference. 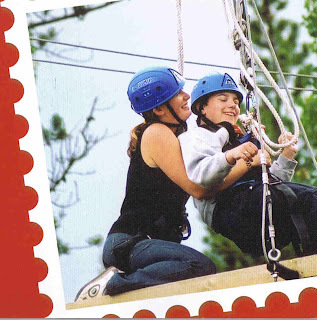 This program is being used by Easter Seals all across Canada. Last year (Edmonton's first) 39 people rappeled down and this year they have a goal of doubling that number. They have room for 70 Superheros. I would love to be one of them this year and with your help, surpass that challenging goal. I've pledged to raise at least $2500. I am asking your help to surpass this challenging goal. Check out this flash movie to see what I have to look forward to (gulp!) and follow the link below to go to my personal donation page. As many of you know I am not very comfortable with heights; but I believe to get to the winner's zone we need to move outside my comfort zone. This adventure will certainly move me 'way' past my comfort zone. (SMILE!!!) With your help I will on Sept. 10th, 2007. We'll see if we can get some pictures to share of this adventure.